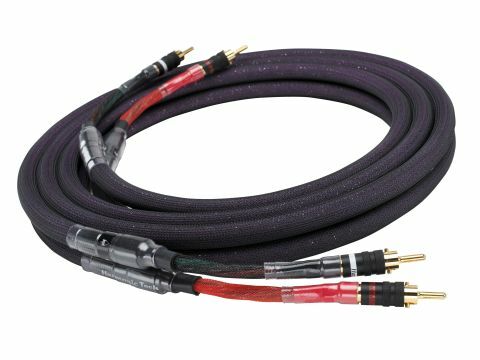 Despite the name of Harmonic Technology's speaker cable, and the fact that it is recommended for the tweeter arm of a bi-wire speaker, or for general use with a single-wired speaker, it's actually a conventional, if high-quality speaker cable. It is highly tractable, and is terminated with Furutech connectors. Construction is based on four individually insulated fine gauge 7N (99.99997%) high-purity single crystal silver and 6N (99.9997%) high-purity single crystal copper conductors for each cable, and two cable runs are required per speaker. This is an excellent sounding design, though very different in nature to the Nordost Valhalla reference cable that was used for comparison. It has a noticeable softness in the way it presents music which curiously doesn't appear to impact noticeably on detail resolution, but does help make it 'inaudible', blending organically into a test system that also used the Harmonic Technology Cyberlight interconnects (tested next issue) in a way that doesn't detract from the remarkable transparency of the latter. The effect is pristine yet airy and organic, with subtle layering and texturing of midband information, and an open, extended feel at both extremes of the audio spectrum. There is a sense of completeness, and of a lack of an aural fingerprint., though the Nordost Valhalla is sharper and leaner, and appears faster. Magic Tweeter is available in preset lengths, and can be extended by arbitrary amounts at a per-metre cost much less than that of the standard terminated cable. But it's still undeniably expensive!